Halloween isn’t the easiest time for us health-conscious moms. Some of us have children with food allergies or intolerances, and for those of us who don’t, we don’t necessarily want our kids to be eating artificial flavors, hydrogenated oils and all that sugar in one night! So here’s the scoop—you can make Halloween treats that are healthy, delicious and fun. Read on for six healthy snack ideas for the kids this Halloween. These adorable mini pumpkins are so easy to make! 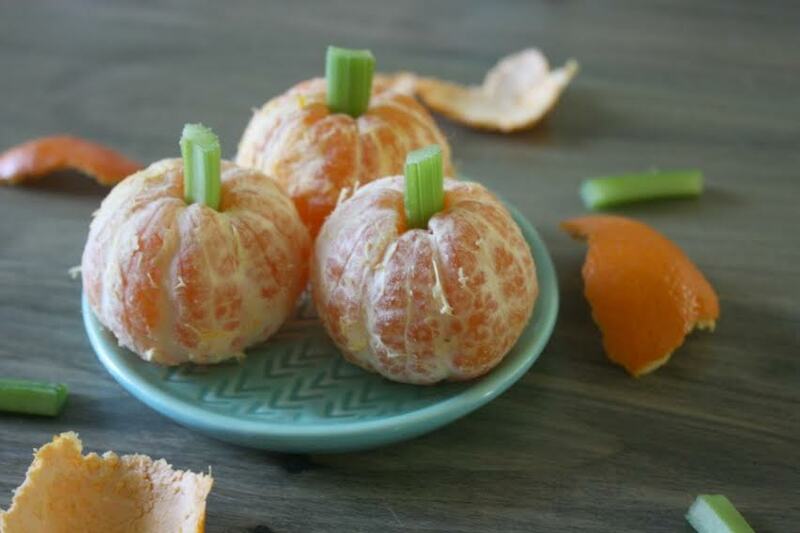 Peel a clementine, chop up some celery sticks and you’re on your way to having a healthy veggie and fruit pumpkin that your kids can devour at snack time this Halloween. Stick medium-sliced stalks of celery into the center of the clementine to create the stems. You can also pair this fun combination of fruit and vegetable with different Halloween platter set-ups to create a display that eerily resembles a pumpkin farm! Clementines are fun to peel, easy to eat and pack a whole lot of vitamin C for your little monster this Halloween. The apple monster is coming! Eating an apple has never been so fun. 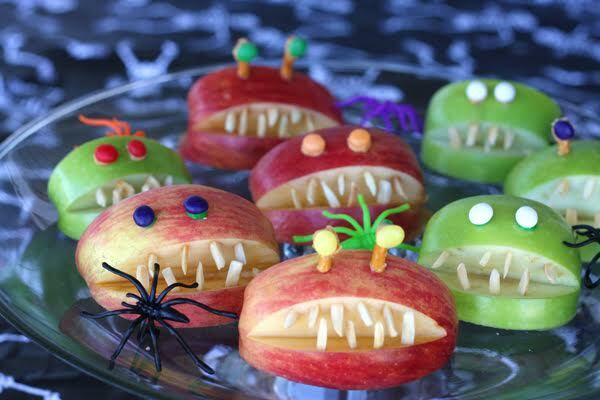 Cut an apple into slices, and get your kids to help you create the mouths and decorate each one. Use pre-packaged almond slivers (or you can cut the almonds yourself) for the teeth, and get creative with the eyes. Using toothpicks and then attaching blueberries, natural mini marshmallows (available at most health food stores) or another fun idea will entertain your kids as they eat their little apple monsters. Buy organic or local apples to reap even more health benefits this Halloween! Nothing says Halloween like a detached hand! Not to worry though, this popcorn hand won’t be too scary for your kids—there’s no fake blood or severed arteries to keep them up at night. 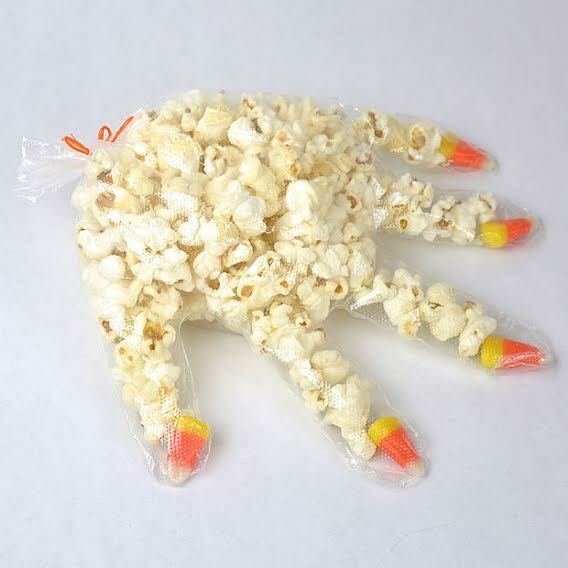 Simply pop some popcorn at home, drop an almond, a piece of candy corn, or another nail-shaped object into the end of each gloved finger, and then stuff them with popcorn! While buying microwave popcorn is temptingly easy, it’s best to buy natural, non-GMO popcorn or pop your own at home to avoid artificial flavors, hydrogenated fats and other weird chemicals. Tie the end with string, a rubber band or a ribbon—and voila, it’s ready to go! These are the perfect party favors or Halloween hand-outs this year! 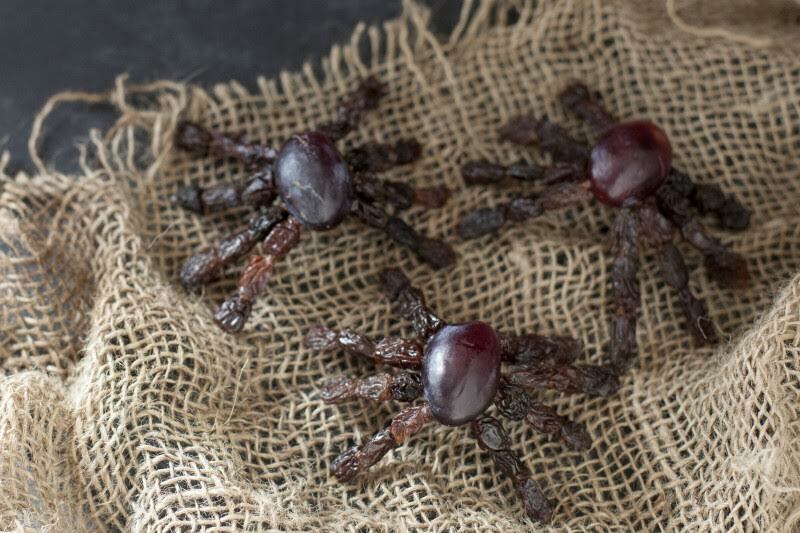 Get your child’s servings of fruit in with these spooky fruit spiders. Grapes, toothpicks and raisins—it doesn’t get any easier than that! Buy darker grapes to create the black look of a spider’s body, and stick raisins on toothpicks to make the legs. Leave some room on the end of the toothpick to stick into the grape body of the spider. And this snack is safe for the kids to help—no sharp instruments needed to cut anything, just grapes and raisins! These little “spiders” look great on party displays or can be a ton of fun for your kid’s lunchbox or at sleepovers this Halloween. This pumpkin hummus has the look of a jack-o’-lantern without all the carving and work! Using red pepper hummus, you can create a plate with fresh veggies surrounding it to make your “pumpkin” look like it’s part of a garden. Dish the hummus into a large round bowl and use sliced olives or black beans to create the eyes, nose and mouth on the hummus’ surface. Use a celery stick for the stem at the top, and you’re done! 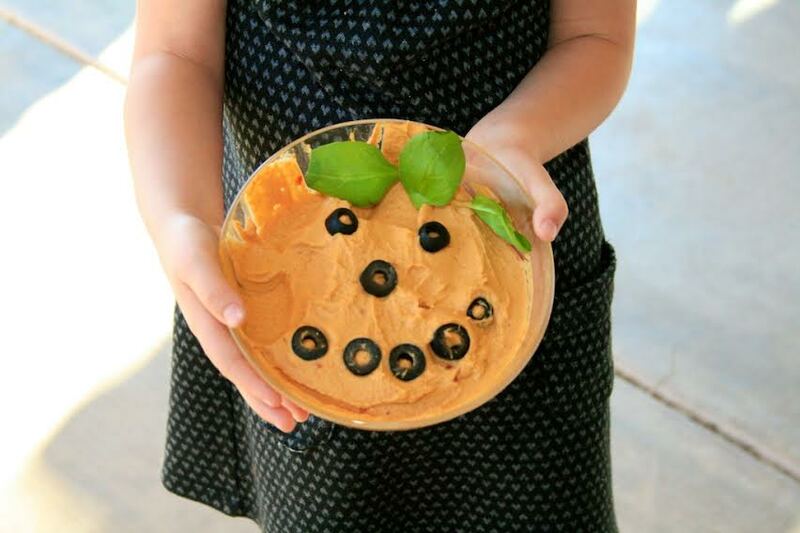 Not only is hummus full of fiber, healthy, and fun to eat, but your kids will love devouring the pumpkin’s face this Halloween! Make your own red pepper hummus or pick some up at the supermarket to save yourself some prep time. These amazing cups are so healthy you won’t believe they have anything to do with candy! Get some pineapple and oranges, and chop them up into edible chunks for your kids. 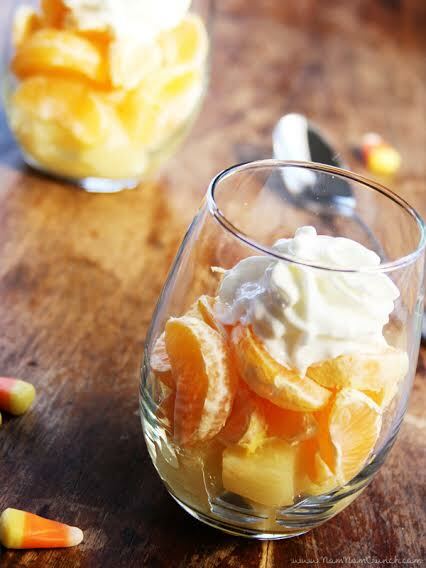 Then place them in order in a small plastic cup or oval-shaped glass to resemble candy corn—yellow, orange and then top with yogurt. This snack can easily be made dairy-free with dairy-free yogurt, ice cream or whipped cream. Top with a candy corn if you’re feeling fancy, otherwise let your kids gobble these up and get their fruit intake this Halloween. You can make them in individual sizes, minimizing mess and clean-up time. Another great way to pack in the fruit! Halloween doesn’t have to be a daunting time for health-conscious parents. You can make your own treats at home and teach your kids healthy eating habits while preparing food together. Your children will love working with you to create something special this Halloween. Best of all, all of these snacks can be made allergen-friendly—replacing the dairy with dairy-free options and the nuts with another vegetable or hardy cheese.